Whew! We’ve officially gotten through the Christmas Holiday. Let’s take a deep breath and revel in this fact. Come on. Join me. Breathe in deep … now exhale. Aaaaaagggghhh. We did it! In my true over-functioning fashion, I am wondering what I am going to do this week while our business is closed. Sure, I will utilize some of that time to repack our household’s holiday decorations, but I have a whole week of down time that I want to put to good use. 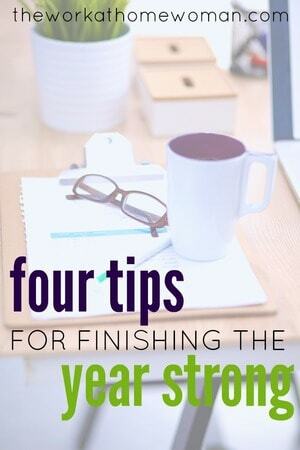 So, I’ve decided to focus today’s post on four tips for finishing the year strong. Take a moment to reflect on all the things you have done this year. Pull some reports to review your sales figures, the results of a cost savings measure you put in place, or the growth and advancement of your team. Whether you are self-employed or work for someone else, this is a beneficial practice. Sometimes we are so focused on our daily “to-do list” that we rarely stop to really analyze and measure all the things we have “to-done.” Not only will you give yourself an opportunity to enjoy your successes, you will also compile some helpful data that may enrich your resume, come in handy during your annual review, or help to persuade a potential new client that their business should be handled by you. There is no way I could compile a list about wrapping up the year right without mentioning goal setting. The Work at Home Woman has lots and lots and lots of articles about goal setting, so, I won’t rehash it all here. Suffice it to say that it is critical to your ongoing success and helps to define what to focus on for the following year. Hi. My name is Christy and I am a pack rat (“Hi, Christy”). I have fought the urge, however, and started the practice of purging and archiving files that are no longer relevant or timely. For our paper records, they either go in the trash/shredder, or they are filed away in those handy banker boxes. We take a moment to label them and detail exactly what each box contains, and then they are off to storage. For our digital files, we use multiple “thumb storage” devices, and again, carefully label them so that we can find files we might need in the future. This keeps my working space uncluttered, my desktop free and easy and my computer running smoothly. Many of us will have some downtime this week. The phones may be quieter and you may have less email volume. Or, perhaps you are off completely this week. Embrace it! We all need a chance to rest and recharge. In a previous article, I’ve talked about the practice of “sharpening the saw.” The point is we are no good to anyone if we are tired, burnt out, or stuck in a rut. We need rest, new perspectives, and time away from our desks in order to approach our work at home responsibilities with fresh ideas, increased creativity, and renewed energy. How do you plan to use this last week of the year? What do you do to wrap up the year and get prepared for the New Year? Any tips for finishing the year strong? Christy Schutz is a communications professional and freelance writer focused on topics like employer/personal branding, career management, personal development, women in the workplace, and female entrepreneurs. She enjoys putting 16+ years of experience in the advertising, recruitment marketing, employee/internal communications and special events industries to good use by helping others to discover, develop and market their own distinct calling or mission. This Tampa Bay, FL-based Mom also keeps herself busy by raising 4 kids, caring for her husband & doting on her dogs Petey and Daisy! I’m definitely doing all of these, especially resting and recharging. :) Thanks for the great suggestions. Enjoy your R&R, Cori. Have a Happy New Year!